Every so often I am asked to represent Barkerville on the road. During the off-season our marketing department helps to keep Barkerville’s profile active by attending a wide variety of tourism-related functions. As a result I have been exposed to some fascinating areas of life. I have represented our site at teachers’ conferences, at trade shows for event planners, at wedding shows, mining events, and arts festivals. But my very favourite gig on the road, ever, ties right in with our next big Barkerville weekend. I grew up in Kamloops. A few years ago, when my husband was heading there to set up a promotional booth at the annual Kamloops Cowboy Festival, he invited me along. The night we arrived we were ushered into a large conference room where we set up our Barkerville booth, complete with a small trough for gold panning. The next morning we donned our period costumes and headed down to work. What had been a typical event venue the night before was now completely transformed. Cowboy artists proudly displayed work that resonated with genuine love for a particular way of life. Cowboy musicians and poets performed at a stage right beside us, and cowboy merchants displayed their wares. Cowboys and cowgirls roamed the displays, connecting and reconnecting, and stocking up on supplies. As the weekend progressed my husband and I were able to peruse a few of the other booths and even attend some performances. We were completely humbled by the culture we’d stumbled into. Real cowboys and cowgirls are big hearted, authentic, generous people in love with a lifestyle that is part of the very foundation of British Columbia. Barkerville’s stagecoach operator, Glen, has strong ties to the Kamloops Festival, and he suggested we try our hand at a similar (albeit much smaller scale) event. There had been similar events in Barkerville before, most notably “The End of the Trail” cowboy festival hosted by Newman & Wright’s Theatre Royal, but things had been quiet on the western front for a few seasons. Our Visitor Experiences team decided to give it another go, and with much help from Glen, Barkerville presented the newly minted Cowboy and Drover Jubilee in 2011. I volunteered at the event, and was thrilled to be a venue host. I spent an entire day introducing artists who filled the Kelly Saloon with music that came so deep from the soul I felt chills (on a sweltering hot day in full Victorian costume!) I was also recruited to be the host of the first “Northern Star” amateur singing competition. What an honour it was to see emerging performers stand before a large crowd in the Theatre Royal and sing for a chance at some great prizes, including recording time in a professional studio. One evening during the 2011 festival we all gathered at the House Hotel for some good old fashioned dancing, singing and socializing. When it was time to go I said my goodbyes and headed down Barkerville’s dark main street. I wasn’t, however, expecting to walk right into a perfect addition to a Cowboy weekend. I looked up to see the most spectacular northern lights painting the sky. Glowing green streaks danced on the horizon; the whole world was awash with magic. I looked around to see the street slowly filling with folks coming out to watch the September night in quiet appreciation of nature’s wonder. It was as if the Cosmos wanted in on some cowboy action, and was putting on a show of its own. We are about to host another Cowboy and Drover Jubilee, September 6-8. The event is really starting to find its shape and place as a crucial part of Barkerville’s September season. We focus a lot on music at this point, and allow our own fine Barkerville merchants to provide the wares, our restaurateurs to offer the grub, and our interpreters to fill in the historical framework… but, as ever, it is our world-class National Historic Site that takes centre stage and provides a most spectacular backdrop for this truly authentic Cowboy experience. 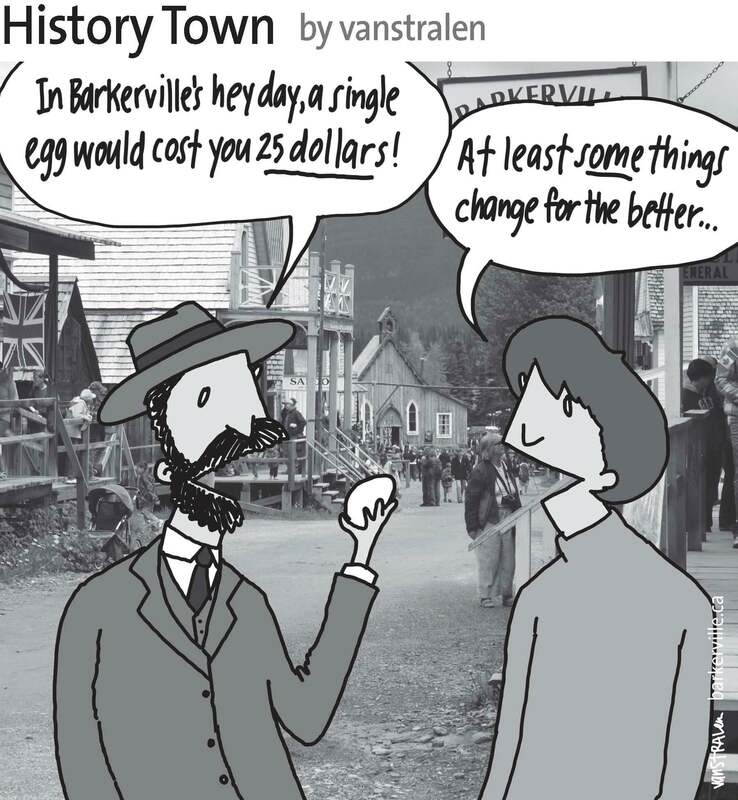 The above one-panel cartoon by Dirk Van Stralen, with accompanying editorial by Danette Boucher, is the fifteenth of twenty weekly entries that will be logged – and subsequently blogged – as part of a 2013 collaboration between Barkerville, British Columbia and the Prince George Citizen aimed at introducing some of the quirkier advantages to living, working, and playing in the Cariboo Goldfields. We hope you enjoy!